KIEV, Ukraine -- Alongside with many former soviet states, Ukraine honours those who fought against Nazi Germany. 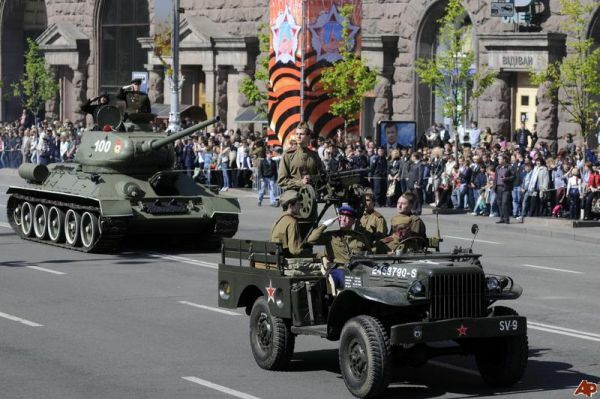 Here the day is widely known as the Great Patriotic war. Being a battleground, Ukraine suffered the deepest wounds to its cities, industry, farmland and humanity. After Germany’s invasion of the former Soviet Union in 1941, about 7 million Soviet Union soldiers and civilians died in Ukraine in the four-year war. For many these sacrifices represent nothing less but triumph of good over evil. However some say only those countries which are influenced by Russia consider this a festive victory day, which is a nod to the Soviet practice. Before the war Ukrainian nationalists had hoped to fashion an independent Ukraine. As a result many fought against both the German and Russian invaders. "The end of the war was a victory for Soviet Stalin but not for Ukrainians." Local historians say that attempts of poisoning the atmosphere prevent veterans’ followers from turning the historical page. They say politicians are interested in keeping Ukraine divided over the issue of the commemoration of the Second World War. Some nationalists who observed Russia's neo-Soviet imperial ambition are now considered by many as neo-Nazis. This provokes clashes which are believed to be orchestrated from above. But old veterans are mainly indifferent to media and political tempest. Veterans say Ukraine should find ways of reconciliation between all the parties participating in Second World War, which was not so much a heroic event but rather a collective tragedy.